Any reason this is going cold? VR actually makes cornering a bit easier imo, as you can see the corner exit out of the side window and know when you can get back on the power. They don't have VR This is actually the cheapest it's been on the PSN store. 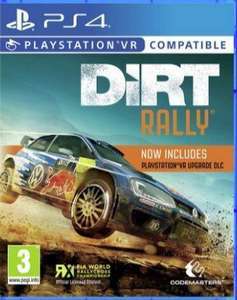 Is the vr mode on this any good or just a gt sport like bolt on? Probably better at the game than your attempt at using the English language. Probably better at the game than your attempt at using the English …Probably better at the game than your attempt at using the English language. Nope not at all. I was just surprised you were not aware your grammar and spelling was so horrendous. Nope not at all. I was just surprised you were not aware your grammar and …Nope not at all. I was just surprised you were not aware your grammar and spelling was so horrendous. Does wipeout support controller gyro? It simply adds VR PoV to the whole game, which I think makes the game a bit easier, due to the ability to see a corner's exit out of the side windows. It's probably the best driving VR experience I've played (Driveclub VR looks awful, is a cut-down experience and suffers image drift, GT Sport is good but is seperate from the main game and while Wipeout looks amazing,with VR applying to the whole game, the roll axis is gut-wrenching). Oh thank you! I added in ‘spelling’ and didn’t change the ‘was’. I’m so glad you fixed it, as it caused me quite the emotional distress for some hours. Oh thank you! I added in ‘spelling’ and didn’t change the ‘was’. I’m so gla …Oh thank you! I added in ‘spelling’ and didn’t change the ‘was’. I’m so glad you fixed it, as it caused me quite the emotional distress for some hours. Cheers, been wanting to try this for ages, but missed it the last time it was on offer. If I remember correctly, it's never been as cheap as this in the past for the game AND the VR add-on. Absolutely no idea why this is cold, but thanks again OP!